High Performance Broadband & RF Modules & Subsystems up to 40 GHz. Elcom Technologies, Inc. designs, develops, manufactures and markets state-of-the-art RF and Microwave modules and sub-systems for commercial and defense applications. Elcom uses innovative design techniques and proprietary manufacturing processes to deliver high-quality products, ranging from 1 to 40 GHz applications. ELCOM Technologies proprietary Zero Phase Hits Technology enables a long term phase stability. The SIDC-5000 is a high dynamic range, fast tuning VHF/UHF tuner-down converter covering the 20 MHz to 3000 MHz input frequency range with 10 Hz tuning step size. A four band switched filter preselector allows fast tuning and provides high rejection of out-of-band signals. The standard IF output center frequency is 21.4 MHz with 10 MHz IF bandwidth. Optional IF center frequency/IF bandwidth configurations offered are of 10.7 MHz/5 MHz, 20 MHz/10 MHz, 40 MHz/20 MHz and 70 MHz/40 MHz. The RF to IF gain can be adjusted over a 30 dB range with 1 dB step size. Utilizing Elcom’s advanced frequency synthesizer architecture which incorporates a direct digital synthesizer (DDS) within a VCO based PLL frequency synthesizer, the tunable LO of the SIDC-5000 features low phase noise with fast tuning speed, low spurious, and small tuning step size. The VHF/UHF tuner-down converter can be controlled remotely through the Ethernet interface, or manually through front the font panel keypad and control knob. The SIDC-5000 is ideal for those demanding VHF/UHF tuner-down-converter applications requiring ultra wide dynamic range and fast tuning speed. Elcom’s SIDC-6000 is a high dynamic range microwave downconverter/tuner covering 0.5 to 26.5 GHz with 10 Hz tuning resolution. The SIDC-6000 provides essentially all of the RF functions of Elcom’s SIR-4000 receiver, excluding digital IF signal processing. The agile LO in this downconverter employs Elcom’s advanced frequency synthesizer architecture which combines a direct digital synthesizer (DDS) within a VCO-based PLL synthesizer. This combination delivers low phase noise, low spurious, and fast tuning speed along with the 10 MHz tuning frequency step size. The system provides scan and sweep frequency control modes. There are two IF outputs: one centered at 1.2 GHz with fixed 500 MHz bandwidth, and one centered at 70 MHz with selectable IF bandwidths of 10, 20, 30 and 40 MHz. The 70 MHz IF has Automatic Gain Control (AGC) with fast attack time and programmable decay time, and the AGC power level is programmable. For operation under manual gain control, programmable attenuators on both IF channels provide 42 dB control range in 1 dB steps. Non-inverting or inverting spectral conversion can be selected independently for the two IF outputs. An option is offered to allow phase coherent operation of multiple SIDC-6000 downconverters. The SIDC-6000 is engineered to provide superior RF performance in terms of dynamic range, low phase noise, and fast tuning speed. This RF performance, along with numerous signal control and system control features, make the SIDC-6000 an excellent solution for a wide range of demanding microwave downconverter applications. Elcom’s SATDC-1000 is a high dynamic range microwave downconverter covering 17.7 to 21.2 GHz with 10 Hz tuning resolution. The agile LO in this downconverter employs Elcom’s advanced frequency synthesizer architecture which combines a direct digital synthesizer (DDS) within a VCO-based PLL synthesizer. Fixed frequency LOs utilize Elcom’s SPDRO phase locked coaxial resonator oscillator technology. This combination delivers low phase noise, low spurious, and fast tuning speed. A programmable sweep frequency control feature facilitates setup of frequency sweeps. There are two IF outputs: one centered at 700 MHz with a fixed bandwidth of 250 MHz, and one centered at 70 MHz with a fixed bandwidth of 40 MHz. Down conversion gain is controlled by programmable attenuators on both IF channels, which provide 30 dB control range in 0.25 dB steps. Non-inverting or inverting spectral conversion can be selected independently for the two IF outputs. The SATDC-1000 is engineered to provide superior RF performance in terms of dynamic range, low phase noise, and fast tuning speed. Its RF performance, along with its wide range of system control features, makes the SATDC-1000 an excellent solution for a wide range of demanding microwave downconverter applications. The VMEST is a broadband microwave tuner/down converter housed in a 3-slot 6U VME package. The VMET covers 50 MHz to 18 GHz with 10 Hz tuning step size. Its compact industry standard VME modular package makes VMEST ideal for complex test and measurement systems where space is limited. Frequency coverage is divided into two bands, each having a separate SMA input connector. Band 1 covers 50 MHz to 2000 MHz. Band 2 covers 2000 MHz to 18 GHz and includes a broad band YIG pre-selector. The desired band is switch selectable. The VMET tuner employs a triple conversion architecture with selectable IF output frequencies at 70 MHz or 140 MHz. This architecture is engineered for low spurious and high dynamic range. The agile LO synthesizer in this system is a standard Elcom IBS, indirect, type of frequency synthesizer delivering excellent phase noise and fast tuning and small step size. 0.01 to 40 GHz geared mainly for Military Applications. Elcom’s UFS family of microwave synthesizers meets today’s most demanding testing needs found in the laboratory, on production lines, and in system development and maintenance. The UFS delivers an unsurpassed combination of ultra fast switching speed, extremely low phase noise, low spurious, and wide frequency tuning range with small frequency step size. The basic advanced direct analog frequency synthesizer architecture provides for ultra fast switching speeds. This is complemented by a high speed direct digital synthesizer (DDS) subsystem implemented within the fastest available COTS FPGA. The DDS subsystem provides for small frequency step size with low spurious. Proprietary fixed frequency, low-phase noise PLL technology for the internal fixed frequency sources, along with the lowest phase noise VHF OCXO commercially available, yields extremely low phase noise. 1-23 GHz frequency synthesizers (in-band) geared mainly for SATCOM applications. 1-23 GHz frequency synthesizers geared for military applications. Based on indirect PLL design technology with internal DDS for fine resolution. 1-23 GHz frequency synthesizers (in-band) geared mainly for high capacity digital radio operating in microwave and millimeter wave bands, supporting modulations up to 256 QAM. 0.5 to 18 GHz single loop phase-locked microwave DRO for SATCOM, Digital Radio and Instrumentation. 0.5 to 26 GHz single loop phase-locked microwave DRO for SATCOM, Digital Radio and Instrumentation. This series employ a unique technique to phase-lock microwave DRO to 5 or 10 MHz crystal reference. Elcom Technologies’ miniature SPDRO sources employ a unique technique to phase-lock a microwave DRO to a 5 or 10 MHz crystal reference. The technique utilizes a single loop for reliable phase-lock performance. By using one loop, size, power consumption and cost are minimized. These units are ideal for digital Radio, SATCOM and instrumentation. ELCOM designs and manufactures modules for high capacity DWDM fiber optic networks (1-40 GBPS). 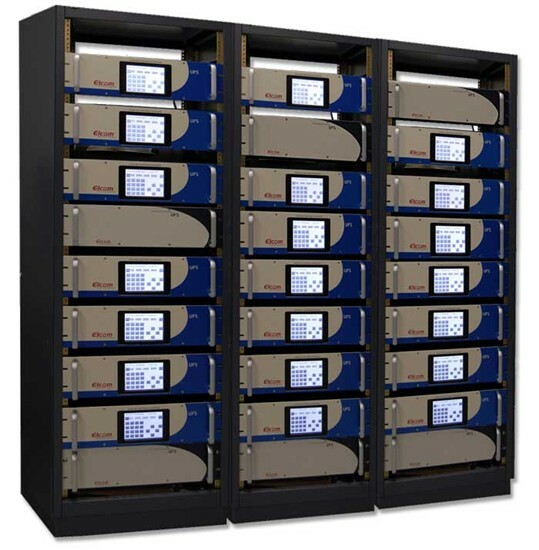 SONET/SDH Continuously Variable Speed Clock Recovery & Data Retiming. 0.3-18 GHz with 200 ns switching speed direct analog broadband synthesizer for coherent radar systems. 0.05 – 18 GHz 100 µsec switching speed 3-Slot VME or 1U X 19” rack indirect broadband synthesizer. Elcom’s SIR-3200 receiver, covering 20 to 3000 MHz, is designed to deliver the high-level of performance required in today’s most demanding VHF/UHF signal monitoring applications. 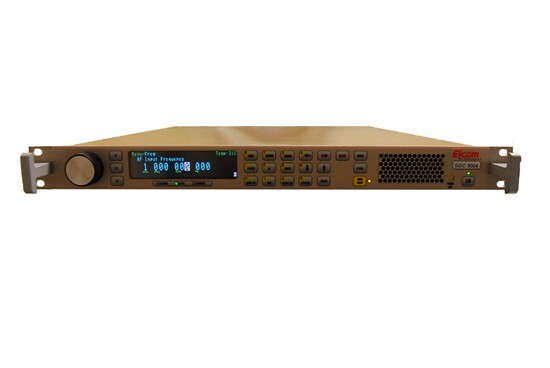 The RF analog front-end architecture of the SIR 3000 offers exceptional dynamic range and low spurious. High-speed, high-resolution digital signal processing provides fourteen selectable IF bandwidths ranging from 3.2 KHz to 10 MHz. Additional IF bandwidths of 20 MHz and 40 MHz are available as options. Utilizing Elcom’s advanced frequency synthesizer architecture which incorporates a direct digital synthesizer (DDS) within a VCO based PLL frequency synthesizer, the tunable LO of the SIR 3000 features low phase noise with fast tuning speed and small tuning frequency step size. The Elcom SIR 3200 VHF/UHF receiver can be controlled remotely through the Ethernet interface, or by manual control using the front panel. Numerous advanced digital signal processing features within the SIR-3200 make available many functions which previously required external instrumentation. The SIR 3200’s advanced RF and digital signal processing technology and its extensive system control functions afford the user capability for nearly any VHF/UHF receiver application. Elcom’s SIR 4000 series of microwave receivers is offered in three ranges of frequency coverage: 0.5 to 18 GHz, 0.5 to 26.5 GHz, and 0.5 to 40 GHz. All models have a tuning resolution of 10 Hz. The SIR 4000 receiver is designed to perform for today’s most demanding microwave signal monitoring applications. With its advanced RF/analog architecture, the SIR 4000 delivers high dynamic range and low spurious. Following the RF/analog frequency converter section in these receivers, a high-speed, high-resolution digital signal processor derives any of eight selectable IF bandwidths ranging from 0.5 MHz to 20 MHz at 70 MHz center frequency. Utilizing Elcom’s advanced frequency synthesizer architecture, which incorporates a direct digital synthesizer (DDS) within a VCO-based PLL synthesizer configuration, the tunable local oscillator (LO) of the SIR 4000 features low phase noise and fast tuning speed while allowing 10 MHz tuning frequency step size. Recent additions to ELCOM Technologies product portfolio include Receivers & Converters used in SIGINT & SATCOM environments. On October 15, 2009 ELCOM Technologies announced shipment of the first production run of their new Ka Band SATCOM Converter.